The Bay Area saw a little bit of everything thing during the morning commute. Rain, wind, lightning, and flooding created some dangerous driving conditions. A power line dipped above Highway 84 near La Honda. PG&E was in the area and the line did not appear to be energized. VIDEO: Watch your Bay Area AccuWeather forecast. It's surprising more trees and power lines didn't go down in the Santa Cruz Mountains. Gusts up to 30 miles per hour ripped through the Redwoods and other trees. Debris covered the road. Caltrans crews were waiting to jump into action. Several spots in the Bay Area also saw localized flooding. The CHP blocked one lane of traffic at the Bascom Avenue on-ramp to southbound Interstate 280 in San Jose around 3:30 this morning, while workers cleared away the leaves and debris. Along the coast, the wind pushed the rain sideways. Waves once again scraping the bottom of the Pacifica Pier. The High Surf Advisory in effect until 4 a.m. Friday. 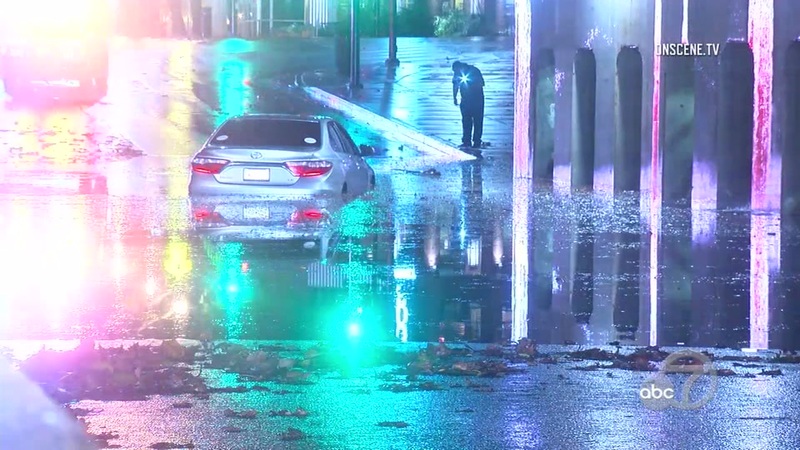 In San Jose, firefighters rescued a driver who tried to make it through an intersection and got stuck in water overnight. Car stuck in flooding in San Jose, California on Thursday, November 29, 2018.